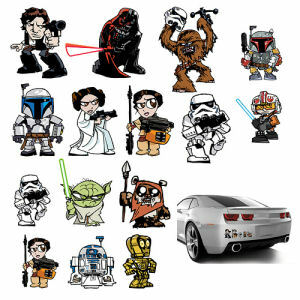 We have Just Sold out of Star Wars Heroes and Villains Family Graphics. This Item is unavailable at present. From the Star Wars collection by Fanwraps. Star Wars Heroes and Villains Family Graphics. The large adult characters are 4.25 inches tall and the smaller child characters are 3 inches tall. Characters include - Han Solo - Darth Vader - Chewbacca - Jango Fett - Princess Leia - Stormtroopers - Boba Fett - Luke Skywalker - Yoda - Wicket the Ewok - R2-D2 - C-3PO. Fanwraps Star Wars Automotive shipping from Canada. No Surprise Border fees or Customs!